As you have probably experienced yourself, you don’t end up high in search engines like Google just like that. You need to follow a smart SEO strategy which inevitably will cost you time and money. If so, of course you want to know whether the time and money you invest does result in the desired effect. Ranktracker provides in this and gives you measurable results, so guessing is no longer in order. Thanks to its rank check, you get a clear idea: you’re either on track or need a change of course. Enter your keywords and lean back. Ranktracker will do the rest. Although, that’s what SwissMadeMarketing claims, the company behind Ranktracker. The tool automatically keeps track of all your rankings on a daily basis for multiple languages and locations, whether you open the tool or not. You can see where you rank in the search results up to the 500th position, automatically get daily updates, monitor a limited number of domains and even see the keywords and rankings per city. Keep track of your rankings with Ranktracker for free! It’s one of the newest additions to Ranktracker: rankings per city. Of course, it depends on what kind of business you have, but it can be very valuable to know how you rank in a particular city. Imagine you’re a local butcher. Then you’re especially interested in whether someone who’s looking for a butcher in your city via Google can actually find you easily. You might not be easy to find nationwide, but as long as you can be found locally, who cares if someone up north can’t find your local butcher down south? Rankings per city can be very valuable as explained above, but on the other hand it’s obviously much more rewarding for a lot of businesses to be able to be found internationally. That’s why RankTracker works for every country and region that’s supported by Google. Think of Google.com, Google.co.uk, Google.com.au, Google.de and Google.fr, whatever country you’re active in or in which language your keywords are. To discover how good or bad you rank for a specific keyword, the first 10 search engine result pages (SERP) are checked. The idea hereof is that it makes a big difference whether you want to conquer the 10th position from the 15th or 97th position. Thus, you can adjust your efforts to this. Besides, now you can monitor your campaign from the very beginning and see the progress you make when Google picks up on your pages but you’re still far away from the top positions. Moreover, thanks to the daily and automatic updates, you’re assured of receiving the most up-to-date data without having to put in any effort yourself. When you purchase a tool from SwissMadeMarketing, you know you’re getting quality. The same goes for Ranktracker. The tool is cloud-based, so you don’t have to download anything but can work from different locations to check your rankings. Besides, you can choose between different types of subscriptions, where you can always use an unlimited number of domains. That means you don’t need to hold back and for example can check the rankings of your competitors too. 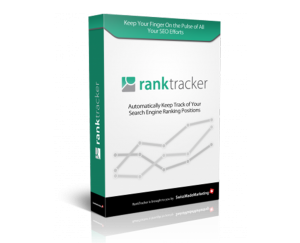 As far as we concern, Ranktracker is a tool of high quality and totally worth your money. Start your risk free Ranktracker account for 30 days now!